We are living in an era where everybody love his phone and wanted to be his mobile phone remain on all the time. When someone’s cell phone battery charging level gone lower than he try very much to recharge his mobile phone as early as possible. And if the charging speed of the phone is slow, than it creates more headache. But why sometimes mobile phone charging with fast speed and sometimes very slow.? 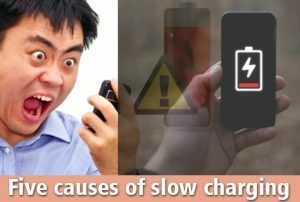 So here are the five main causes of slow charging of phone battery. An important reason of slow charging of cell phone’s battery is unreasonable charging cable. Often we put cables by twisting them due to which their efficiency affected, especially when the cable is broken at the beginning and ending point. A good and right cable increases the speed of charging and similarly bad and breakable cable does not charge the mobile phone. If you charge your mobile phone by attaching a data cable with your laptop, than you deserve for slow charging. If you want to get your mobile charge speedy, than instead of connecting the data cable with your laptop, plug it directly into the socket so that it can charge with the actual speed of charging. For maker companies provide a charger with mobile according to mobile battery. Therefore, to charge your mobile effectively with good speed, always use the charger that is compatible to your battery. If you do not care about it, then it will decrease the charging speed and health of the battery affected as well. If in this modern era of technology world you have an old model of mobile phone, than it is useless to expect fast speedy charging. Because phones that have not fast speed charging system means turbo charging support, those always disturb their users in terms of battery. In short cell phones of old technology always take much time in battery charging. if you are busy and someone start to disturb you than what will your reaction? Definitely you will not be to able to do your work correctly. Same thing happens with mobile phone when during charing you plung out and use your mobile phone again and again. This is also a cause of slow charging. If you want to get charged your mobile speedy, than after putting it for charging, leave for some time and if possible switch it off. In this way mobile phone will charge faster and take a short time to complete charge.